For the past few months I have been getting requests from my readers to share a collection of breakfast recipes and lunch box ideas for Indian kids.Some people specifically asked me to share recipes excluding the usual idli , dosa , poori , pongal. Not just by mails, some of my new friends who visit my blog for the first time asked me whether I have a collection of kids lunch box and after school snacks ideas. At that moment,I realized there are many people like me worrying and thinking about what to prepare for kids breakfast,what to pack for their school lunch box,snack box,how to make them eat healthy foods etc etc. When I told about my readers request to my friend Shalini, she helped me to frame this list of recipes for kids. Most of these recipes are the ones we usually make for our childrens breakfast & lunch box and can be prepared easily in busy mornings. We took nearly 2 hours over phone to prepare this exhaustive list. I should thank my readers for insisting me to do this list. And Many Many thanks to you my dearie Shalini. But for your help,this post would not have come up. 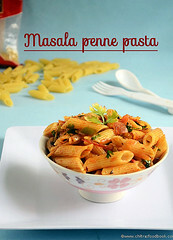 In this post, you can find the list of Indian style sandwich varieties, North Indian Paratha recipes, pasta & Noodles recipes, rice varieties, wraps & rolls, Salad & milkshake recipes that are generally liked by kids. I have given the links for recipes that are already available in my blog.I will share the remaining in my upcoming posts. Nowadays most of the kids are picky eaters. So Friends,please take this list as a reference, make your own variations if you are a non-vegetarian and plan your kids breakfast ,lunch & dinner recipes based on their liking. Do share your ideas & mention the names of recipes that are left out in this list. I will add them up. I hope this list would be useful to all the moms landing on this page. 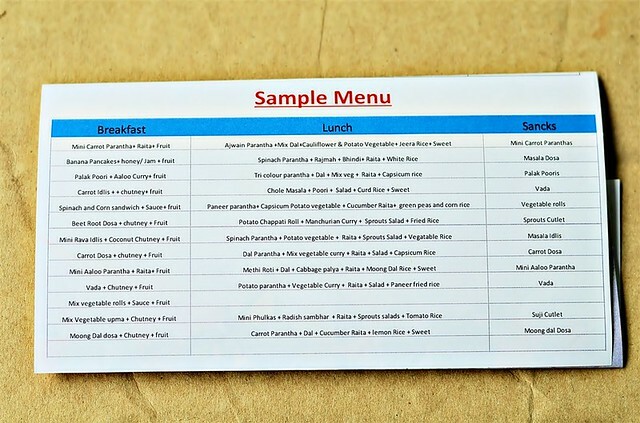 I have also shared a picture of Sample daily menu of my daughter’s healthy meal program catered by Amrutha Caterers in her school.Many working women have opted this meal program for their kids to give a balanced diet.+919036060369 is the contact number of Amrutha caterers. You can also frame a table like this and follow it. 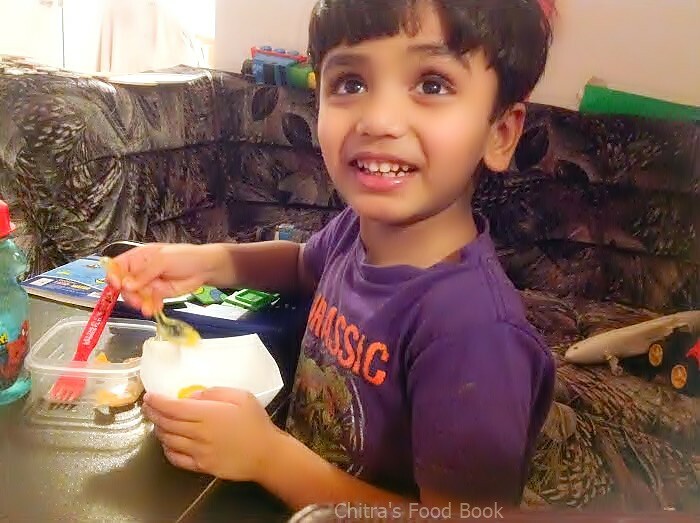 A very special thanks to my sister Radha for sharing her son Krish Karthik’s picture as a cover photo for this post.Once she had made my badam halwa and clicked a pic while he was eating .When I told about this post,she happily shared this picture with me.Thanks dear,Love you. I will start posting Ganesh Chaturthi Festival recipes from Saturday.Lets check out the list of kids recipes below. 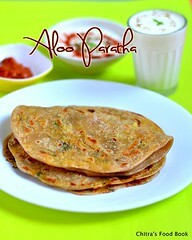 Basically kids love colorful dishes and food that look small in size( mini).So you can try to present the food more colorful and make small sized poori , paratha , idli & dosa for them.For example,we can make mini uttappam kind of dosas by adding vegetables like carrot,coriander leaves & onions.When my daughter was young,I used to make dosas like alphabets,numbers & in different shapes.Buy some cookie cutters in various shapes and cut the idli,dosas,poori in those shapes.It would be attractive for them.While making sandwich,make bite sized or finger like pieces for them to hold easily.You can add ghee,cheese,nuts & choco syrup in the dishes to fascinate the kids but remember to use them in moderate quantity.Try to google search for various decoration ideas and make the food attractive to the kids. Here is the picture of sample healthy meal menu from my daughter’s school.Right click & save the image to view the actual size of this picture. 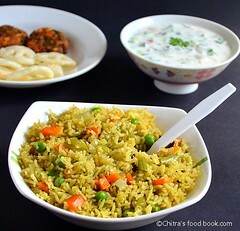 Thanks for visiting this page.Happy cooking ! Disclaimer : I have made this post based on my own idea.Please give credits to this post & do not copy it without my permission.Thanks for understanding. thats an awesome collection chitra.The boy looks very very cute . Really a good collection of recipes. Will try at home. Wow ..thank you and your friend for taking the time and effort to compile this. Awesome indeed! Nice effort of such usefule ideas, also awestruck with the caterers who have given a superb meal list..thnx for sharing... I wud like to know the cost for the service, and do let me know of their taste..is it tasty?? Nice collection Chitra. Keep up the good work. BTW, where r u put up in Blr? 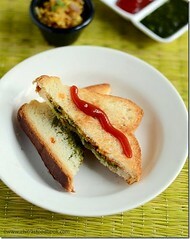 Thanks a ton Chitra for the amazing blog. Makes my life easy to plan my son's lunch box. Great list. I like it, Thanks for sharing. 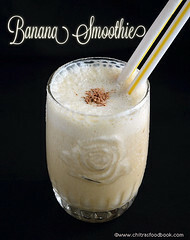 Thank you for sharing these varieties of recipes with minute details and good photographic presentation. 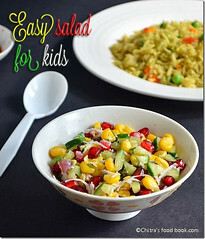 They are tempting as well healthy for kids.